He has tweeted 692. But until Sunday, there had been nary a peep from Saunders on Twitter since March 26, 2014. The silence was broken when Saunders expounded on three-point shots. When you have as many jobs as Flip Saunders has — part-owner, head coach and President of Basketball Operations with the Timberwolves — it can be hard to keep up on social media. He has tweeted 692 times in his life, but until Sunday, there had been nary a peep from Saunders on Twitter since March 26, 2014 — not long before the end of his first year back with the Wolves, when he ran the front office, and roughly two months before he took over coaching duties as well. My daughter, born four days later, has never known a world in which Flip tweets. Sad, really — until now. There was Flip on Sunday with a flurry of three tweets on a subject that has proven in the past to get under his skin but one that nonetheless has provided others on Twitter plenty to talk about: three-pointers. Specifically: Will Saunders and the Wolves ever get better at both making them and incorporating them into their offense? And more to the point: How does Saunders even FEEL about them? And in the final analysis: Does what Flip says about threes match what he does about them — all things, even mitigating circumstances, considered? Conclusions if we only pay attention to the tweets: 1) Flip loves three-pointers. 2) Flip loves the fans. 3) Flip hates being told he doesn’t love three-pointers. 4) Flip doesn’t care much for #Blogs and #Experts. But as the excellent Steve McPherson notes, feelings are not numbers. And while the numbers will never tell us how Flip feels about three-pointers deep down in his soul or if his heart skips a beat when a three-ball walks into a room, they can tell us that in his years as a coach they have rarely been a part of his plan. Saunders’ teams — from his early Wolves teams to the Pistons to the Wizards and, yes, last year with the Wolves — have never shot a lot of 3-pointers. It’s really that simple. Here are where his teams have ranked in terms of 3-pointers attempted for his entire coaching career: 28th, 25th, 22nd, 27th, 28th, 25th, 21st, 27th, 27th, 21st (this was the season Saunders was fired by the Wolves after 51 games), 10th (his first season with Detroit), 19th, 22nd, 24th (with the Wizards), 27th, 20th and last season, 30th — or dead last, in other words. KG was never a three-point shooter. He was deadly on the block and from mid-range. Then again, so is Tim Duncan. And the Spurs have morphed — sometimes with coach Gregg Popovich kicking and screaming — into a deadly three-point shooting team. In 1999-2000, for instance — early in the Pop run, and the season after they won the NBA title — the Spurs ranked 24th in the NBA in three-pointers attempted at 10.8 per game. Last season, they attempted more than twice as many — 22.5 per game — and ranked in the middle of the pack. So that speaks to the evolution of the Spurs and the evolution of the three NBA-wide in the past 15 years. A more recent mitigating circumstance: the Wolves don’t have a lot of great three-point shooters. This is very true, and it became even more so last season after the trade of Kevin Love. 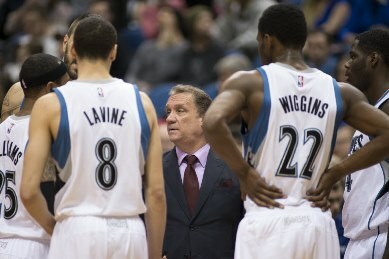 The 2013-14 Wolves, with Flip as the boss and Rick Adelman as the coach and Love as the focal point, attempted 21.4 threes per game — the same number as the Spurs and in the middle of the NBA pack. Last year, with Flip running the offense and Love gone, that number plummeted to 14.9 (last in the NBA, as noted). So yes, the players you have can and should dictate how many threes you shoot. Q Everybody makes a big deal about three-pointers. The Wolves give up a lot of them and don’t make many of them. I’m not here to question what you’re doing, but do you see Zach LaVine and Andrew Wiggins eventually becoming guys who can shoot consistently from that distance? A [Wiggins], right now, is leading us. He will, when he gets more confident. And Zach can shoot. Zach’s biggest thing is he’d be a much better three-point shooter if he was off the ball. Right now he’s on the ball trying to run the team, not knowing when he should shoot it. … We’re doing the right things, and eventually when Ricky [Rubio] comes back we’ll get into a flow and guys will be able to make threes. That interview came 22 games into the season; 15 of the 16 games in which the Wolves shot the most threes last season came after that, so they did get a little launchier as the year went along. Still, Flip should never complain that he doesn’t have the horses to shoot threes because he’s the one running the stable. If we’re trying to get to the root of the issue, I’d wager this as a conclusion: Flip’s not crazy about threes; he hardly “loves” them, even if he says he does. But even if they don’t fit directly into how he likes to construct an offense, he’s smart enough to know that the game has evolved the point that threes are often vital to success (both shooting them and defending them, both areas of weakness on last year’s team). And I would guess he’s smart enough to know that going 33 percent from three-point range is better than going 45 percent from 18 feet. What he’d really like is for everyone to get off his back and trust that he’ll start working threes into the offense more as he evolves and his players evolve. The preponderance of evidence to the contrary — consistent bottom-third rankings of his teams in terms of three-pointers attempted — makes that blind faith quite difficult to accept. So at the end of the day, I have a feeling the Bloggers and Experts are going to keep firing away until Flip’s teams do. I just hope we don’t have to wait another 16 months for another tweet or for evidence that he’s a man of his word. Who is Chih-Wei Hu and will the Twins regret trading him?